I first made this beautiful appetizer at one of my cooking classes. I had only been doing cooking classes for a few months when I had to make this recipe before a live audience. No sweat. For those of you that know me, and some that are getting to know me, there are two things that are obvious. I love to cook and I love to talk. So, doing both in front of people, seemed like an easy task. So, bring on the Caramelized Onion and Apple Tarts with Smoked Gouda! First tip–remember that caramelizing onion takes a good amount of time to cook. But, no problem. I can talk for 30 minutes while I stir onions to their perfect, golden color. Second tip–Do not assemble puff pastry anywhere near a warm stove or oven. Since there was such a small space to demo the recipe, I chose to place my baking sheet on top of the stove burners, forgetting that they had just been used to caramelize onions! So, just picture the buttery, puff pastry dough melting all over the place. Not to worry. Julie Childs had it right…”No apologies”. I kept my cool, kept talking of course and completed the recipe. The best part of the story…the flavors in this recipe are so good, no one cared that the puff pastry was not in perfect little squares! Lessons learned…have fun while you are cooking, discover a new recipe, and stay away from the cook top when assembling! 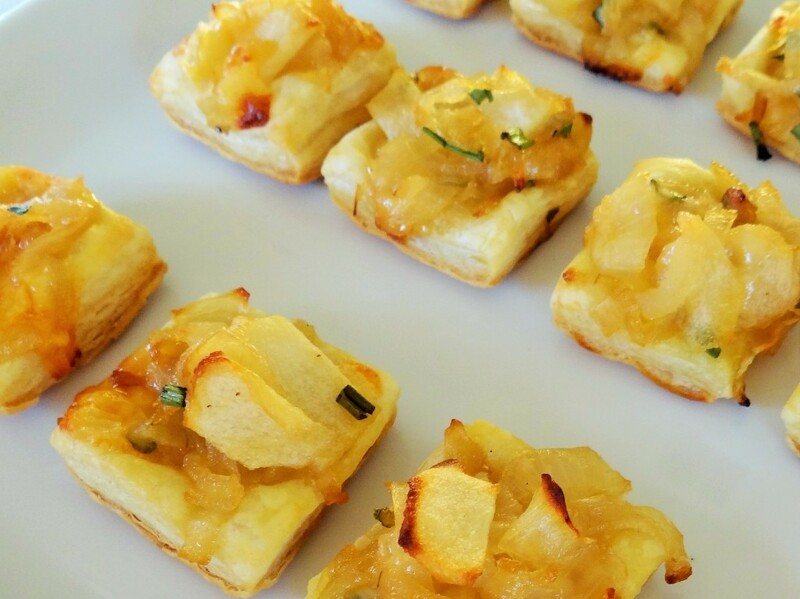 So, on the Eleventh Day of Appetizers, Dianna is bringing to you…Caramelized Onion and Apple Tarts with Smoked Gouda. In a large fry pan over medium heat, warm the oil. Add the onions and the 1 tsp. salt and cook, stirring occasionally, until the onions are golden brown, about 30 minutes. Transfer to a large bowl and let the filling cool to room temperature. Position 1 rack in the upper third and 1 rack in the lower third of an oven and preheat to 400°F. Line 2 baking sheets with parchment paper. In the same pan over medium heat, melt the butter. Add the apples and sugar and stir to coat the apples. Cook, stirring, until the apples are just starting to caramelize and have softened, about 10 minutes. Transfer to the bowl with the onions and stir in the cheese, chives, thyme and the ⅛ tsp. pepper. Cut the puff pastry into 2-inch squares and place on the prepared baking sheets, spacing the squares about 1 inch apart. Brush the pastry squares with the egg mixture and place a heaping 1 Tbs. filling in the center of each square. Season with salt and pepper. Bake, rotating the baking sheets from top to bottom and front to back halfway through baking, until the pastry is crisp underneath and golden brown on top, about 25 minutes. Transfer the baking sheets to wire racks and let the tarts cool to room temperature. Serve at room temperature. Makes 32 tarts.